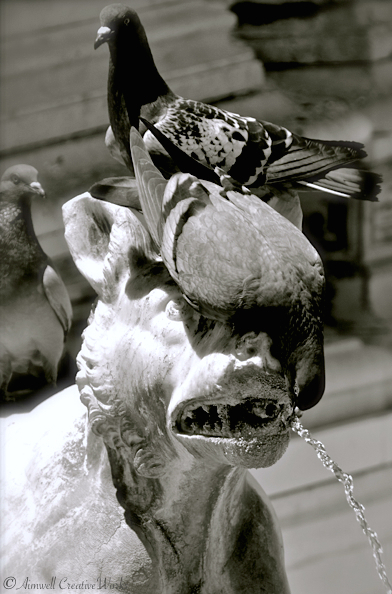 On a scorching hot day pigeons wait their turn for a drink at the Fonte Gaia ~ Piazza del Campo, Siena. This entry was posted in Animals, Photography, Travel and tagged Aimwell CreativeWorks, birds, black and white, Dorothy Chiotti, Fonte Gaia, Leanne Cole, monochrome, Photography, Siena, Travel, water. Bookmark the permalink. Thank you. It was fun to watch these birds vie for the water spout. It was 35C that day. I love that they are waiting their turn. Great photo, Dorothy, and more interesting in B&W, than it would be in colour, I think. Good editing choice.